Be sure to tune in tonight at 9pm Eastern time (8pm Central) to hear President Bushâ€™s announcement of his nominee to the Supreme Court. Buckle your seatbelts, this will be the political ride of 2005. Get set for the battle royal that will make Election 2004 look like childâ€™s play. Let the games begin! â€œEverybody knows this is about what Watergate was about and Iran-Contra was about: bringing down a Republican president the left could not defeat at the ballot boxâ€ (source). We have come full circle. This is precisely what the Democrats accused the Republicans of doing when Bill Clinton was impeached. Go figure. Partisan hacks on the left would love to see Karl Rove, the â€œarchitectâ€ of President Bushâ€™s 2004 electoral triumph, take the fall for outing Valerie Plame as an undercover CIA operative. The investigation into who leaked what and when to which reporter has already landed The New York Timeâ€™s Judith Miller in jail for not giving up her source. Time magazine reporter Matt Cooper also would have been jailed had not Karl Rove given him permission to name him as his source. Newsweekâ€™s Michael Isikoff reports today on the e-mails that reveal the conversations that took place between Rove and Cooper. Isikoffâ€™s conclusion is this: â€œNothing in the Cooper e-mail suggests that Rove used Plame’s name or knew she was a covert operativeâ€ (source). Is the witch hunt over yet? Far from it. 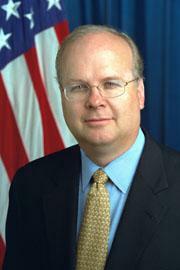 Rove is too juicy a target, and it is likely that weâ€™ll hear the left carping about his role in the leak no matter what the investigation turns up. I donâ€™t know where the investigation will end, but I think itâ€™s interesting that so many left-leaning pundits do. Hat tip to Justin Taylor for bringing our attention to Tim Challiesâ€™ summary of Jim Ellif’s article: Southern Baptists: An Unregenerate Denomination. Challiesâ€™ summary and Ellifâ€™s article deal with the widely known fact that the membership roles of Southern Baptist churches are woefully inflated. Many Southern Baptists have simply grown accustomed to the fact that only about 37% of the names listed on their churchâ€™s role actually shows up regularly for worship. This statistic reveals how far Baptists have drifted from their tradition as Baptists. Historically, Baptists have been a people who adhere to a regenerate church membership. That is, we believe that the only people who are allowed to be members of the church are those who profess and practice faith in the Lord Jesus Christ. Eliffâ€™s statistic shows that about 63% of Southern Baptist church members do not in fact practice their faith by attending regular worship services. Earlier this week, I listened to an interview with Paige Patterson in which he talked about how a pastor can get a church to practice church discipline when that church has never done so before. This can be an extremely difficult move for a pastor, but Patterson suggested that, after preaching about the meaning of membership, a pastor could begin by pursuing non-attending members. If the non-attending members either cannot be found or do not want to return to the fold, then they should be removed from the church membership roles. This is Pattersonâ€™s advice, and I agree that it is a good place to start. There is much more to be said on this, and I refer the interested reader to the 9Marks website for resources on and teaching about church discipline within a Baptist context. 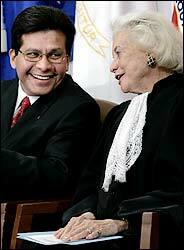 The New York Times and the Washington Post report this morning that conservatives are rallying against the possible appointment of Attorney General Alberto Gonzales to the Supreme Court to replace Sandra Day Oâ€™Connor. This is good news, and no doubt the president will get the message. If you thought the 2004 presidential campaign was a difficult, bitter, acrimonious, blood-earnest fight to finish, you have not seen anything yet. The Bush-Kerry battle royal was a battle royal because of their sharp ideological differences with respect to the culture war. In this war, the most prized territory to occupy is the Supreme Court, and now that territory is up for grabs. Now that Sandra Day Oâ€™Connor has announced her resignation, we are about to witness a fight that will make the 2004 presidential campaign look like ring-around-the-rosy. As Tom Goldstein said today after Oâ€™Connorâ€™s announcement, â€œNow the gloves are entirely off. In political Washington there is no more important question to the left or the right [than the composition of the Supreme Court]â€ (source). For President Bush, this is crunch time. Millions of Evangelicals came out to vote for President Bush last November because of his promise to appoint â€œstrict constructionistsâ€ to the court. This means, of course, that he has promised only to appoint judges along the lines of Scalia and Thomas, not Ginsburg and Souter. If President Bush is to make good on his election promises, then he has to put all his â€œpolitical capitalâ€ on the line to see a hermeneutical conservative appointed to the bench. This means that rumors of Alberto Gonzales being a potential appointee better be just thatâ€”rumors. Alberto Gonzales opposed a parental notification law when he was on the Texas Supreme Court and is obviously not the kind of justice that evangelicals had in mind when they came out to the polls to vote for Bush. If Gonzales becomes Bushâ€™s nominee, then evangelicals need to go shopping for another party. After all, why should we support any candidate or party that will not deliver when itâ€™s crunch time? More on this later. Believe me, much more on this later.